Sendmode has a number of options for giving your customers a GDPR compliant way of opting out of receiving communications from your business. Sendmode has a free and easy to use website which allows customers to remove themselves from your list. The website is stoptxt.net and the opt-out message to add to your campaigns is ‘optout @ stoptxt.net’. Many of our customers are using this currently. Below is the stoptxt.net website. You can also use the mobile keyword STOP. Your customers can text STOP to our free shortcode 50015 to be removed from your list. For example ‘Freetext STOP to 50015 to opt-out’. This is free for your customer. There is a small charge on you for each opt-out using this option. 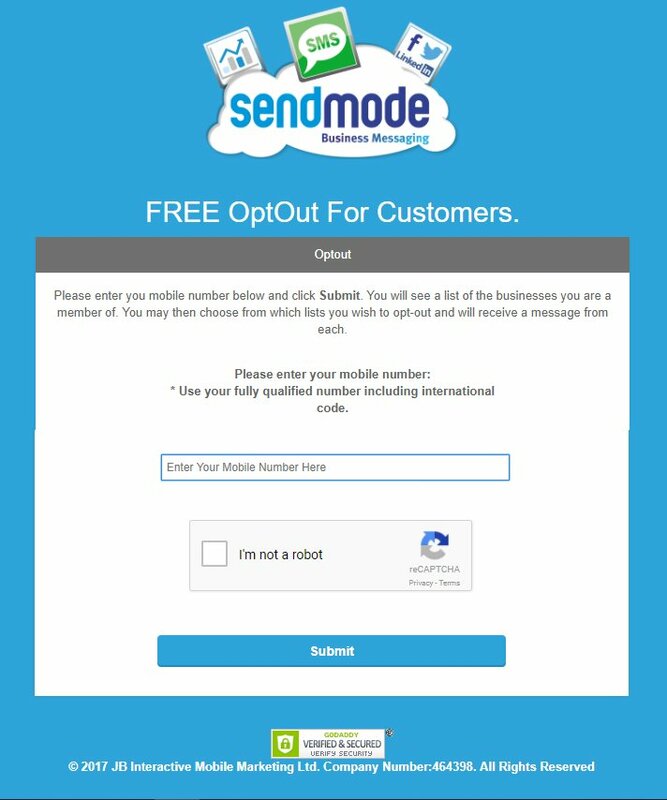 Sendmode keeps a copy of your opt-out lists and makes sure nobody on your opt-out list will get sent messages from your business. You can query when a number opted out should your customers issue a data access request. All the above option will keep you GDPR compliant. If you have any questions on GDPR and keeping your SMS marketing compliant, please do not hesitate to contact Saoirse ([email protected]) or John ([email protected]) in our data protection team at any time.